A doctor will review your order and write you a prescription, if appropriate. This prescription is then forwarded to a pharmacy. The pharmacy will have your medicine delivered to you within one to three working days. Read more about this process here. Airomir inhalers are called bronchodilators. They are used to open the airways and prevent attacks in people with breathing problems such as asthma and chronic respiratory disorders such as COPD, chronic bronchitis and emphysema. 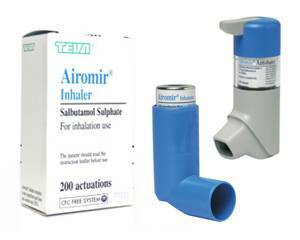 Airomir inhalers contain the active ingredient salbutamol, which causes the muscles in the airways to relax. This allows the airways to open and makes breathing easier. Always shake your inhaler before use. If you are using your Airomir inhaler for the first time, or if you haven’t used your Turbuhaler inhaler for two weeks or more, release four sprays into the air away from face. For specific information on how to use Airomir inhalers, see the package leaflet. Before you use the inhaler, breathe out as far possible. Immediately place the inhaler or Turbuhaler inhaler in your mouth and start to breathe in slowly and deeply through the mouthpiece until your lungs are full. Hold your breath for 10 seconds before breathing out slowly. Airomir allows the muscles in the airways to relax and dilate during an asthma attack. By opening the airways, Airomir makes it easier to breathe. For prevention of exercise-induced asthma attacks: two inhalations before the exertion. The recommended use in adults for prevention of acute asthma attacks is one to two inhalations at a time. Do not exceed eight inhalations a day. Children should use one inhalation at a time, and no more than four inhalations a day. If the effect of Airomir lasts for less than three hours, you may need to adjust the dose. Do not do this without consulting a doctor first. Ask a doctor before use if you are pregnant or breastfeeding. Sign up for our newsletter now and get a £4 discount on your next online consultation. We are reachable by phone from Monday till Friday between 8:00 AM - 8:00 PM. © 2019 Dokteronline.com. All rights reserved. Nothing on this website is an offer by Dokteronline.com. Translations are available, but Dutch is the official language of the country of origin of Dokteronline.com and therefore rules. Any use of this website, the services provided by Dokteronline.com and the compliance to applicable local rules and regulations is at your own risk and responsibility and you agree that you entered this website at your own initiative. Product information is only originating from public sources, healthcare providers and/or patient information leaflets and never contains an (own) opinion or advice from Dokteronline.com, and/or any form of influence on your own choice. Dokteronline.com is operated by eMedvertise N.V., Willemstad, Curacao, Kingdom of the Netherlands. For payment purposes Healthrock Ltd., 11-12 St. James's Square, London, United Kingdom, SW1Y 4LB, registration number 09056454 can be used.